sorry it’s taken so long to get back with you. It is a cross over between stargate and Babylon 5. Yes it is a private mod. What I have done from the stargate mods I have been using is copied the textures from the texture folder of their mod to the texture folder of mine. Then I copied the brush files from the window folder pertaining to main view, picture and hudicon from their folder to mine. Next I went to my brush file and added the file names that was added to my folder so the game would recognize them. Then I opened the brush files copying the description, example: Picture_Asgardthor, then paste in the correct spot in that ships entity file. In each case for the stargate ships the icons have shown up in game. I have followed the same order for the SotYR but they are not showing up in game. I have checked to make sure the textures are in the texture folder as well as the texture names are the same as listed in the brush files. I have made sure the brush files located in the window folder that I copied are listed in the brush file so the game will recognize them. I copied and pasted the description name directly to the ships entity file, but nothing I do is fixing it so the icons show up in game. I hope this description helps. Also I have recently come upon a mesh that the convert mod will not convert. And of coarse the mesh resizer won’t resize unless it’s in txt format. Have you come across this and if so how do you get around it to resize. If interested I could send them to you. sorry for the long absence. Not sure what might be the problem to be honest. I would have to have a look at it but as of now I've got rather little time to spare for sins modding. you could send me the brush and texture files you are using and i could try to have a look. With the outstanding models, I've no idea how to create the mesh files that are needed. I can however work with solidmodeling software and export via .STL files etc. Would that be beneficial at all? Would they be able to be imported and converted to the format you're looking for? Just trying to see if there's something I can tackle to help with the burden of model making, hopefully without creating any additional challenges. Edit: Also of note, there are a larger number of models popping up freely available for download/printing that may be of use to this project. Is there a list of outstanding models that you're still looking for? I can do some digging and see what I find. As for new models I have to say I still have about 30 models I think that I would need to bring ingame first. Modelling never was too much of an issue, rather doing quality UV work of the mesh and texturing that. Also I refrained from taking any model that I have not been granted explicit rights to use for this mod. They are all "homemade". You can, if you have the required skills, add the models yourself or create an "unofficial" extension pack for this mod that only contains the additional content for all to download. Well, I might be able to get some resources together to help with these things, all things depending, on the two questions below. For the models that you do have, but are not yet in game, and awaiting UV, could you get a list of which ones those are? More importantly for me, could you provide a list of which items are left that you do not have models for at all? Well...I know at one point TobiWahn was maintaining a wiki of the progress of all models in the game for all races...We've shifted servers several times over the years as "free" ceased or the vendor closed up shop. He'll have to answer the question in detail but there is a yes to both. Hi there, it's been a while since I last posted. Lots of RL and such. But, I'm still around. I've made a new version of the Vorlon carrier, more in line with the existing capital ship whilst still in line with the other new models. Carrier should be escorted as it is basically a drone fighter platform, but I've added point defense turrets. I styled them a bit like the defense turret that came out of Kosh's vessel when Sheridan and Ivanova took a look at it. Hope you like it. 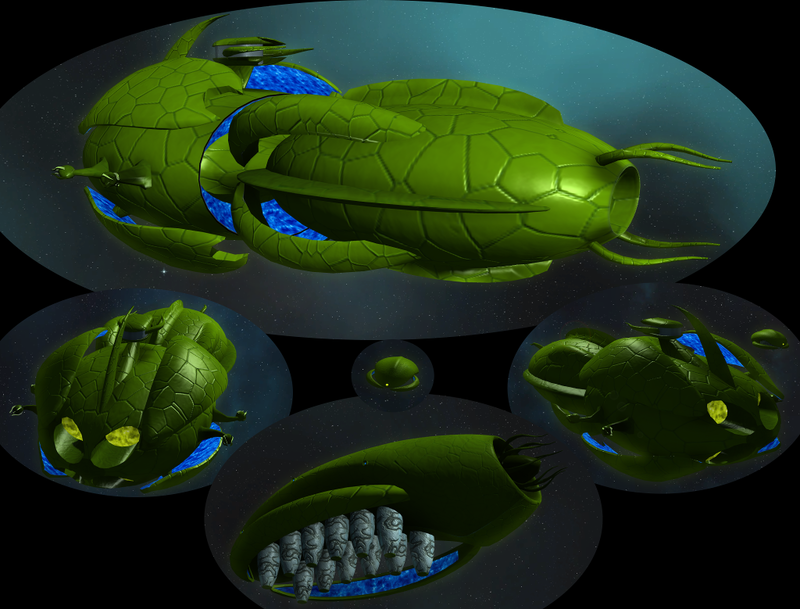 TobiWahn if you could send me the texture templates you used for the other Vorlon vessels I can try to do the layout. Lighting backing is beyond my software tools atm though..
Hi and welcome back! It’s been a long while. Glad to see you are doing fine and thanks for contributing a new model. I really like it. As for the templates - I have to look it up. It has been a while for me as well. Doing roughly one to two models a year now. Also I’ve switched computers. Now on a brand new MacBook Pro and while it makes it easier to do stuff since I now have my computer with me everywhere I have even less time due to work. But I will try to send you the texture template tomorrow. And you can also just make a basic texture to give me an indication where you want what effect to be applied and so forth. Hi there, it's been a while since I last posted. ... TobiWahn if you could send me the texture templates you used for the other Vorlon vessels I can try to do the layout. Lighting backing is beyond my software tools atm though.. Here is an example texture. I use a 3D shader in Cinema4D to create the texture. I've rendered it out to a flat texture in 4K for you but it will look different when I directly render it onto the model. Thanks TobiWahn! It seems to be the one used for the smaller vessels though; isn't it better to use the one from the siege vessel? Or is that the part where it'll look different once you render it directly? Also, am I correct in assuming that the same parts can share the same UV only if they're not expected to have a different light baking? And that ambient occlusion is only for each object regardless if it's on top or bottom because the ambient occlusion applies only to the object itself? I'm thinking of redoing the model a bit; the arms seem to have no function. I'll make them support the carrier front lobe. 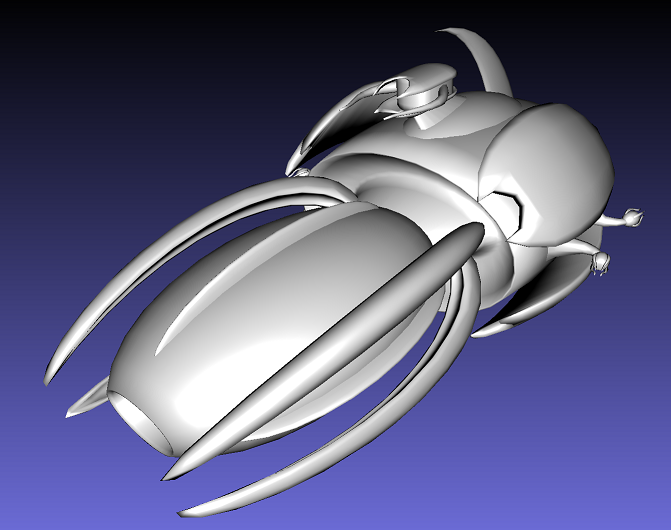 Perhaps add some small tentacles at the front to give it a (weak) frontal firepower. Look at the ship file for weapons load out and abilities, it will help with the model build. it has a relatively weak forward gun, and fighters. So that's fine. Is it possible to add point defense (flak like) side guns which can only target fighters? The main gun can stop being able to target fighters in this case. It's too slow for them anyway. This way the overall firepower of the ship remains, but also is in lore a nice addition. This ship was meant to be an answer to heavy figther/bomber attacks, for which the Vorlons do not typically have a good answer. it has a relatively weak forward gun, and fighters. Who ever is doing the final model tweaks that would require adding two additional hard points to hang the weapons from. I've sent TobiWahn the modtool project with the texture per mail. I've also included the hard points for all weapons, hanger and exhausts. I got the Carrier in the game with the texture template from TobiWahn. Also included a Vorlon Live Giver (colony ship) to get rid of the Advent model. Nice! Was the shield render flag set to false? Thanks! Yes, for both vessels the shield render flag was already FALSE in the entity files. I can make tight fitting shields for them if you like, but I think you intended this for B5 has no visible shielding, right? Btw it looks like you have to turn off "Events" in the game options; my game crashed just as I got a notification that a vasari titan was randomly spawned. -Modders can now design ships with the ability to destroy planets. Added a new buffInstantActionType "RuinPlanet" to accomplish this. An example ability called "AbilityRuinPlanet.entity" demonstrates its usage. Yep, been meaning to do that but the last two updates were more than cosmetic. Life has kept me busy and I haven't looked for a non-binary English translation of the files to see how easy or hard it will be to encode that. What I do recall when it first came out was a long string of buffs which is a pain to trouble shoot. I'll see about it once the kids are out of school for the summer. I have done some repainting on the colony ship. Also, I've been messing around with ParticleForge and Gimp (took me a while, sorry TobiWahn no repaint yet on the Carrier.. I'll send you when I've finished both) and upgraded the Vorlon weapons on most ships. All vessels (CapCruiser, CapCarrier, Destroyer, Transport, Colony, Heavy drone, Drone, Fighter) now have a nice lightning effect charging up (and down) like a growing/shrinking sphere. 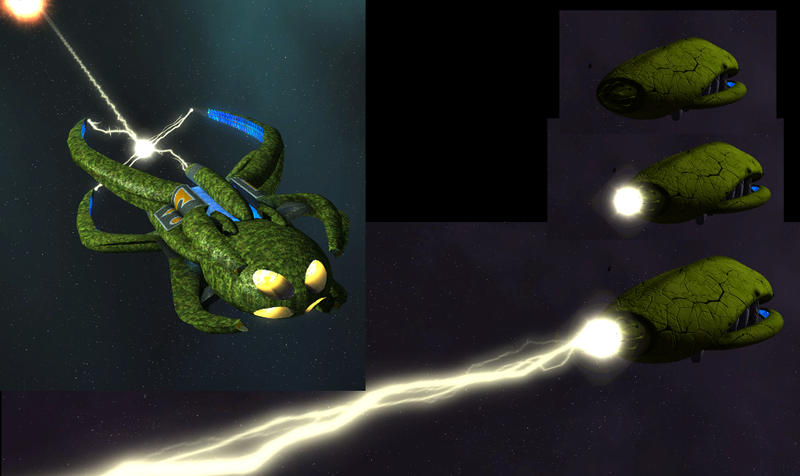 The CapCruiser also has an updated lightning cross that builds up the sphere, and fits the ship's arms nicely. The Siege I'd like to propose to update to a CapSiege, and I've already made a frigate Siege but need to paint it first. The same goes for a frigate to supplement the CapCarrier. I'll need to think about a weapon effect for the current Siege (hoping to be a CapSiege, it has the size ) Any suggestions? I'm hoping i can do something resembling the PlanetKiller but smaller. The Siege already has the disc, and it's easy to believe the PlanetKiller has evolved from that vessel. Changing the race's hyperspace entry and exit to the blue swirls from the jumpgate also adds to the immersiveness of the game. Wow, you've upped your game!